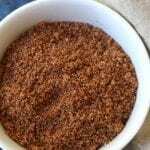 A dry rub that makes chicken, ribs or your favorite cuts of meat taste phenomenal. Measure all ingredients into a small mixing bowl and thoroughly mix to fully incorporate spices. Rub on all sides of your favorite cut of meat. *Please use as many organic ingredients as possible. * Recipe makes enough rub for 1 full rack of ribs, 1 large piece of meat or 6-10 chicken pieces.